In analyzing the political crisis in Brazil, we have to take into account the position of imperialism, particularly that of the United States. There is an old joke in Latin America: why is the United States the only country in the continent where there has never been a coup d’état? Answer: because it’s the only country that doesn’t have a U.S. embassy. 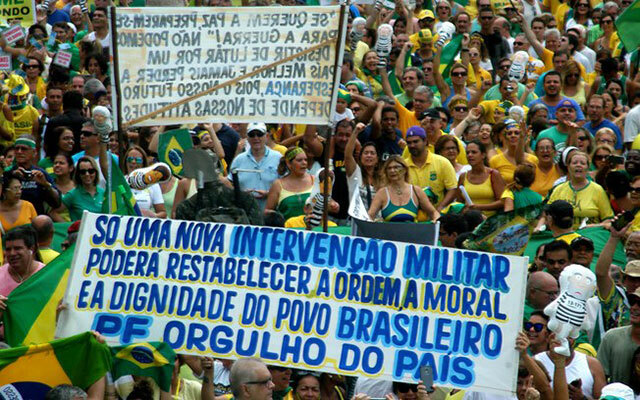 But Brazil is no banana republic, it has a relatively strong bourgeoisie with its own interests. The PT and pro-PT left is acting as if the Brazilian government is a hindrance for the U.S., which is absurd. Even if U.S. spy agencies bug the telephones of the president (as they also did, and are surely continuing to do, with imperialist allies, such as Chancellor Merkel in Germany), the governments led by the PT have acted as firemen for the International Monetary Fund in Latin America, and as a sheriff for Yankee imperialism in the Caribbean, supplying mercenary troops for the occupation of Haiti. The Brazilian popular front has played a key role in pressuring Venezuela, and beyond that the construction giant Odebrecht is now helping open Cuba for massive capitalist investments, building a port there. A shift in imperialist opinion about the government of Dilma Rousseff. In general, Washington doesn’t want any big upheavals in the largest country in Latin America. Even so, there is no reason to presume that the would-be masters of the planet always act with consistency, and there are already indications of changing opinions among imperialist spokesmen. Three months ago, both The Economist of London and the New York Times came out against impeachment of Dilma Rousseff. 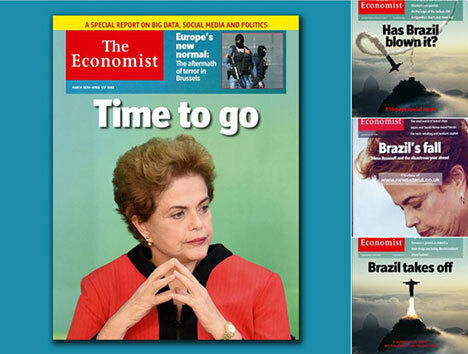 Now The Economist (26 March) published an article on the Brazilian political crisis with the title, “Time to Go,” declaring that “The tarnished president should now resign” rather than be impeached. 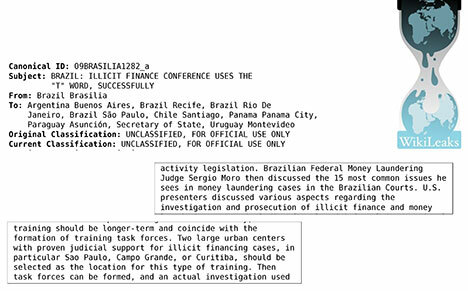 Excerpts from a telegram of the U.S. State Department from October 2009, unearthed by Wikileaks, on a conference where Judge Sérgio Moro was highlighted and which proposed to establish a training center for task-forces on money-laundering precisely in Curitiba. Operation Car Wash has been carried out in close collaboration with the imperialists of Washington and Wall Street. Concretely, in Operation Lava Jato (Operation Car Wash), Moro authorized the Federal Police and the Public Prosecutor’s Office to work together with the FBI. In June the judge sent teams of investigators to the United States where they “had access to bank records totaling US$230 million (Folha Política, 19 July 2015). In exchange, last October an FBI task-force spent a week in Curitiba working with Moro’s team collecting information to be used in court cases in the U.S. against Petrobras. What are these cases? The main one is a class action suit demanding reparations to the tune of billions of dollars for supposed losses suffered by Wall Street investors (among them several Brazilian funds) between 2010 and 2014. They allege that due to corruption, the balance sheets published by Petrobras were distorted in order to hide the bribes and laundering of funds paid to suppliers like Odebrecht. A second corruption investigation of the Brazilian oil company is being carried out by the U.S. Securities and Exchange Commission. In fact, the entire so-called Car Wash investigation is being carried out together with Brazilian and imperialist sectors which are seeking to break Petrobras’ monopoly of oil production from the famous “pre-salt” layer in the Atlantic. In order to feed the voracious appetites of the imperialists, the popular-front government already organized several auctions of exploration of oil fields. However, above all due to the present extremely low prices of the black gold, the oil majors are particularly interested in engineering services and construction of oil installations. It is precisely in this industry where imperialist companies like giant Halliburton want to win contracts which until now were the private hunting preserve of Odebrecht and the OAS, two of the main targets of Operation Car Wash. In another State Department telegram unearthed by Wikileaks, from 2 December 2009, the PSDB candidate in the 2010 presidential elections, José Serra, is quoted promising that, if elected, he would “change the rules” which gave Petrobras exclusivity in oil exploration in the pre-salt layer and and change the model of “partnership” giving the former state company 30% of oil production. The current legislation (in 2010), approved by Lula’s government, alredy meant an enormous privatization of this strategic resource, guaranteeing private (and above all imperialist) companies 70% of the exploration of the pre-salt layer. According to another law, passed in 2013 in response to the previous year’s mobilizations, a percentage (rather small in reality) of the profits from pre-salt production is earmarked for health and education. The imperialists’ major interest in this question was indicated in an article published by the liberal journal Foreign Affairs (4 March 2015), under the title “Crude Calculus,” which stressed the importance of the stipulation requiring 85% local content of technology and equipment, and the “potential for corruption.” That journal is part of the base of support of Hillary Clinton who, it should be recalled, gave the green light for the coup d’état which overthrew President José Manuel Zelaya of Honduras, in July 2009. The fact that Barack Obama said of Lula that “he’s my man” at a meeting of the G20 doesn’t mean that there aren’t other imperialist sectors involved, in one way or another, in attempts at “regime change” so popular in Washington. Today, it seems that the right-wing president of Argentina, Mauricio Macri, is the favorite of the White House, and of Wall Street for having agreed to finally pay off the vulture speculators who snapped up at bargain basement prices the loans defaulted on by Buenos Aires 15 years ago. Loyal to his imperialist patrons, the ex-candidate Serra presented, four days after the giant anti-Dilma mobilization in March 2015, a bill, PL131, that would eliminate the partnership requirement and Petrobras’ 30% cut of oil production. The FUP oil workers union, the CUT labor federation and the Workers Party (PT) itself declared their opposition to the bill. However, when it was approved by the Senate this past February 25, President Rousseff approved it in hopes of winning the sympathy of the capitalists. As usual, the FUP, CUT and PT didn’t mobilize anything, nor did they shut down any facilities to oppose this fateful law. Note as well that Judge Moro participated in various forums sponsored by the PSDB and that his wife is the lawyer for that party in the state of Paraná, as well as for Royal Dutch Shell oil company that won a slice of the Libra Basin rights in the 2013 auction. It was notable that when Odebrecht published a list of more than 200 recipients of its largesse, the large majority of them with the PMDB and the right-wing opposition parties, Moro (who lifted the right of privacy for the phone conversations of ex-president Lula and President Dilma) clamped a ban on publication of the details of the payoff list, clearly in order to protect the PSDB, the “Progressive Party” (a rightist-militarist outfit), the Democrats (DEM, the continuation of the political vehicle of the military dictatorship) and the rest. We do not know the specific connections between Moro and the imperialist companies and governments. But it is quite clear that he is working together with forces who are those most interested in privatizing to the max the formerly state-owned Petrobras, which has been largely sold off to imperialist and Brazilian investors. A 43-year-old judge in a provincial city does not act so aggressively – not only interrogating and jailing officials of Petrobras and the president of the largest contractor and construction company in the country, but also ordering the search, capture and forcible transfer of the ex-president, and the publication of private telephone conversations of the current president, the head of state – without having powerful allies protecting him. Nevertheless, it’s necessary to note the opinions of the general who was replaced, who publicly criticized the president (and all the parliamentary politicians) for corruption and was baying about “awakening the patriotic struggle,” speculating about the possibility of a “controlled fall” of the president, “discontinuity” in government or a situation of “crisis” in the current political context. At the same time, this same General Mourão authorized an official homage to Colonel Brilhante Ustra, “ex-commander of the DOI-Codi [intelligence division] of the Second Army in São Paulo, a unit that was one of the main centers of repression by the military regime and where 45 prisoners died.” It was precisely in this unit where Dilma Rousseff, today president, was tortured during the dictatorship (Zero Hora, 30 October 2015). 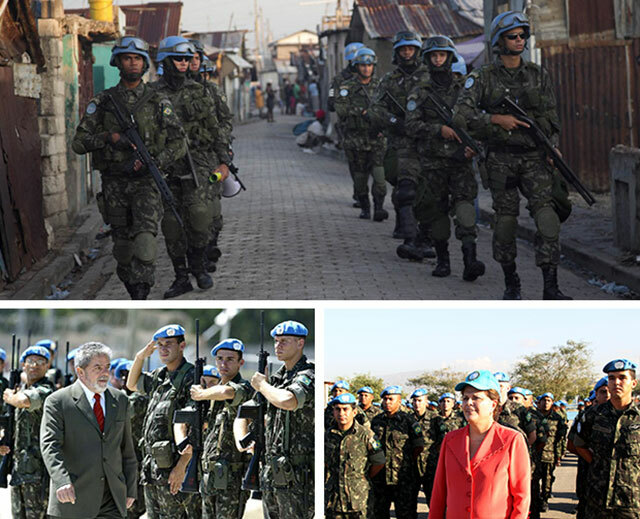 The armed forces are surely full of elements like Mourão and Heleno, at every level. For the moment, the crisis does not seem to have reached into the military institution. The active elements are the Military Police, which has acted as a protagonist of the first order, and the Federal Police, which is acting as if it is the armed wing of the Public Prosecutors Office of Judge Sergio Moro, when in reality it is the police who are calling the shots. 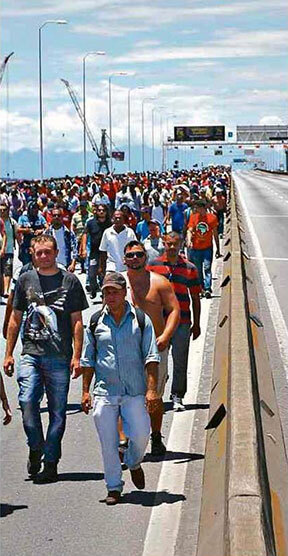 It should also be noted that the big right-wing mobilizations are being financed and promoted by the employers’ federations, and that the activity of the Federation of Industry of the State of São Paulo (FIESP) against the current popular-front government recalls its siege of the government of João Goulart in the run-up to the 1964 coup. And that Super-Moro is being promoted as the savior of the nation by the Famiglia Marinho, owners of the media giant Rede Globo (which also vociferously supported the ’64 military takeover).